When he ended his earthly life, and his mortal remains were cremated, his ashes - thus it has been said - were divided into eight parts which were closed up and protected by the princes and communities. Or ten, or eleven, according to different traditions. More stupas were built over these relics. 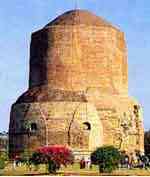 Of the really old stupas still intact today, most are said to contain relics of the Buddha. In Tibet, the construction of stupas (mchod-rten, pronounced chor-ten) came to be an intregal part of the spiritual life. The symbolism is so vast and complex it is slightly rediculous to attempt any simplification of it. Every part of the outwardly visible stupa has specific significance, yet this is only the surface: within are scriptures and relics in defined positions, each equally alive with symbolic meaning. So in building a stupa, or contributing in any way towards one, is considered a *good thing* by Buddhists in general. It is a structure that invites (or even invokes) peace. 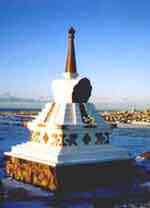 "This stupa is called a dharmakaya stupa. Within it, the guru dwells unchanging. The Buddha said that whoever sees a dharmakaya stupa will be liberated by the sight of it. Feeling the breeze nearby the stupa liberates one by its touch. The sound of the tinkling of the small bells hanging on the stupa liberates one by their sound. 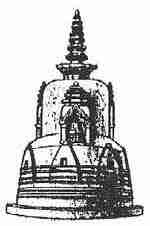 having thus seen or experienced this stupa, by thinking of one's experience of it, one is liberated through recollection." "The stupa that enshrines the teacher's physical remains is at once a reminder of the teacher and the embodiment of the pure and all-pervasive aspect of the awakened state. As His HolinessDilgo Khyentse Rinpoche has said: "When a great being passes away, his body is no more. But to indicate that his mind is dwelling forever in an unchanging way in the dharmakaya, one will erect a stup as a symbol of the mind of the budhhas." As the Buddhist teachings point out, every element of a buddha's physical body is pervaded with enlightenment. Thus, even after cremation, the teacher's remains are considered sacred, because they are the distilled essence of his or her physical form and are therefore themselves the embodiment of enlightenment. Because it enshrines these relics, the stupa is powerful. It is said that in venerating the stupa, one can "meet" the teacher. The visual impact of the stupa on the observer brings a direct experience of inherent wakefulness and dignity. Stupas continue to be built because of their ability to liberate from confusion simply upon seeing their structure. The shape of the stupa represents the Buddha, crowned and sitting in meditation posture on a lion throne. His crown is the top of the spire; his head is the square at the spire's base; his body is the vase shape; his legs are the four steps of the lower terrace; and the base is his throne. 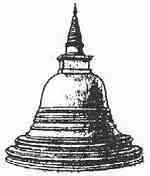 The stupa also symbolizes the five elements and their relationship to enlightened mind. 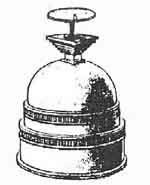 These are the essential attributes of a fully realised human being: the base of the stupa signifies earth and equanimity; the dome, water and indestructibility; the spire, fire and compassion; above the spire, wind and all-accomplishing action; and at the very top, the jewel represents space and all-pervading awareness. The stupa is a mandala, or sacred arrangement, containing all of these enlightened qualities." "It is at the ancient, well preserved site of a Buddhist cave monastery. It was probably destroyed by raiders from the north in about 460 CE (AD). The site was excavated in 1959-60 and was only slightly damaged in the 25 years of war. The stupa is hewn into the solid rock of a large hill - and so cannot be seen from the foot of the hill - it has entrances through caves at the foot of the hill. From a distance all that can be seen is the square relic chamber on the top." Karli, (Near Bombay,India).In the back of a cathedral like cave, sculptured out of solid rock.This, and the ones below, illustrate styles developed during the next 1,000 years.